Sincerely, Kinsey: Maps, globes, and telescopes. Lately I've had a thirst for maps and globes of all sorts. It's most likely just a small case of wander lust, but I'm indulging in the obsession none the less. I actually found one that I swooning over at an antique shop last summer that I believe is the culprit for my spark in interest. 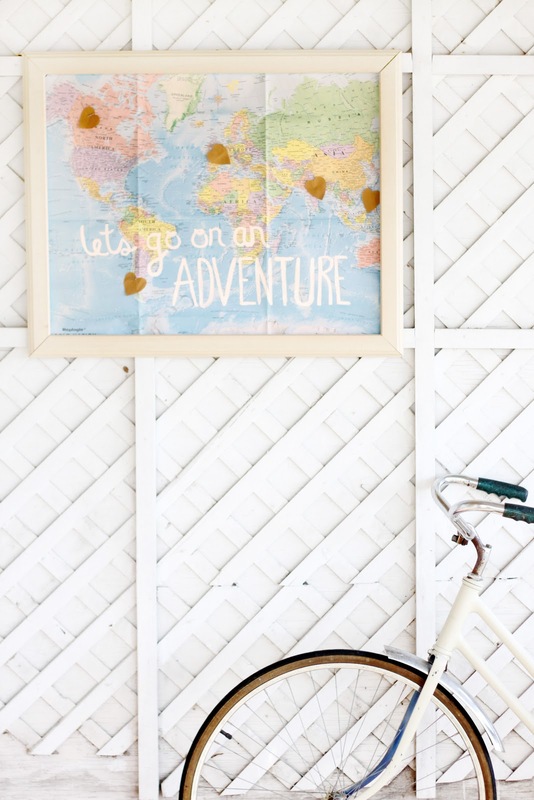 Here is simple DIY on taking a map, new or old, and giving it some character all your own..
Supplies: frame, map (I found my at a garage sale last summer, but teacher supplies store are always a good place to look if you can't thrift one), paint, pins, fabric or scrapbook paper. Pantry Supplies: paint brush, craft glue or masking tape. First, measure your frame to your map. You'll want to tape or glue it to the back and cut off any excess so that you can't see it from the sides. Then, paint! You can paint anything you like on your map. I chose, "let's go on an adventure". While the paint is drying, cut out hearts with either fabric or paper. Once it's dry, you'll pin these hearts on the places you would like to travel to most. I feel like a broken record, but you are seriously amazing Miss Kinsey! Every post is pure magic! very pretty! i want to make one of these! i really want to go to peru. I love maps! I wan't to go basically everywhere, but my first couple of places would be Italy, Scotland, and Vancouver Canada! I thought of getting a map and putting pins where I wan't to visit, but then all you would be able to see would be pins, haha. I have so many maps hanging in my room! I think they help fuel my travel obsession when I'm at home. I think my next destination is somewhere hot and beachy like Australia. I have been having dreams of Melbourne! This is amazing! I worked on a fun map DIY over Christmas which I'm sharing online later this week. I might need to fill my entire wall with map-based art though! This is such a great idea especially for me because I wanna go everywhere! This is SUCH an amazing idea and I'm definitely making one! I've been lucky in that I've been able to travel the world with my husband's band, but there is still so much more I want to see! My favorite countries to visit so far have been Australia, France, Belgium and Costa Rica. But I really want to go to India and Japan. Thanks for sharing this! Aw I love this so much! Funny how your European heart covered almost one third of the entire continent :) Well it is enough to see here in Europe. I dream about Japan, a long vacations that would allow me to see it from the south of the country to the very north of Hokkaido. Best in spring or fall. Second choice is USA, especially for nature. I would also need a lot of time for this one. My first stop would have to be the Greek Isles. I've never been out of the States before, and it's making me so very sad. A little tip about India, don't go during the summer if you want to visit the Taj Mahal and such. It's incredibly hot and humid then, and northern India didn't really appeal to me anyways. I've heard a lot of good stuff about the coast though, and Nepal is super close and a million times more beautiful and friendly. Absolutely love this idea! It's so colorful and a great conversation piece! I'd love to go to Africa, Italy, or Ireland... though anywhere far and different would do! Excited to be your newest follower! Love this idea. We have a scratch off map so that we can mark where we have been together but it's cute to have a map of where we are planning to go. I <3 this very cute. I really like this idea. I would love to keep a map of all the places my husband & I have gone & where we would like to go. I love this! Maps are my favorite!! I have been thinking for awhile about doing one myself and pinning the places I have been and the places my husband has been and then the places we venture together in different colors. Great job!! This is a great idea...you could do the same thing with a map of the United States so it would be easy to mark/pin the cities/states you have visited. Color code it for each family member. Thanks for the post. this is too cute.. i just found your blog, i'm following now! it's so so lovely, and your photography is great! This is so cute! I love love love it. Paul and I are saving up to go to England, hopefully early next year. Fingers crossed! What a cute idea! I'd definitely have a BIG ol' heart over Italy as I can wait to visit there again. And...I'd love to go to Iceland and Ireland to meet relatives and explore where my family came from. My fiance and I are moving to a house in June with a big living room...we'll definitely be making one of these to hang! Thanks for the great idea! Such a great idea, i've been thinking about doing something similar myself for a while but you've inspired me to definitely do it! I love this! I want to make one. It's an old post of mine, but I'm as in love with the print as ever. Ah, that's a lovely idea! Fun! I can only encourage you to take a trip to India....its mindblowing! I ve just got back from my trip in southern India and already cant wait to pack my backpack to explore the majesty od Rajasthan and the holy city of Varanasi! I can only encourage you to take a trip to India - its mindblowing! A country of contradictions with overwhelmingly friendly people - its such an intense experience! Just got back from my trip and already cant wait to pack my backpack again to explore the majesty of Rajasthan and the tea plantations in Darjeeling! What a fabulous diy! I am definitely bookmarking this idea and can't wait to give it a try. I would love to travel through France but first on the list is Japan for my husband's 30th birthday this year (his choice). There is nothing more romantic to me than embarking on a new travel adventure with the one you love!